By now you've probably heard of the amazing benefits of Resveratrol. But if you're not familiar with Resveratrol, it's been deemed a miracle substance and has been featured all over major news networks like Fox News, CNN, Today and the list goes on. What's so great about it? Resveratrol has been scientifically proven to activate the longevity gene, enhance energy, endurance, cellular metabolism and rejuvenation without any side effects because it's a 100% natural substance that's found in the skins of grapes. Many celebrities are taking Resveratrol these days to maintain their youthful, radiant, wrinkle-free appearance. 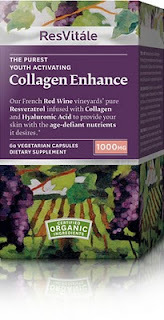 ResVitale Resveratrol Collagen Enhance contains both Resveratrol and Collagen for vital for smooth, glowing skin. Collagen production diminishes with age. While collagen occurs naturally in the body, production begins to decline with age, leading to many of the age-related skin issues we see today, such as wrinkles and flaccidity. Collagen Enhance 1000 mg deposits collagen proteins at the source, where cells can use them to enhance natural production. A powerful infusion of hyaluronic acid helps hydrate and plump the visible layer of skin, while French trans-Resveratrol boosts cellular energy to restore youthful DNA. What's so different about this Resveratrol then all the others? ResVitale stands out because it's made from certified organic ingredients and it's raw materials are sourced from organic vineyards in Southern France. Every bottle can be traced back directly to its origin and provides an antioxidant value equivalent to hundreds of glasses of red wine per serving. Once I started taking this product I noticed a huge improvement in my skin. I'm in my early 30s and have the beginning signs of ageing with a few fine lines on my forehead. Within the first week, I noticed a much brighter complexion, the reduced appearance of fine lines and wrinkles, and believe it or not, after two weeks I could no longer see any wrinkles in my forehead. I also noticed brighter eyes and a youthful, pink glow to my skin. I felt I looked 10 years younger! I didn't have any side affects while taking this product and highly recommend it to anyone who wants a more youthful appearance. ResVitale is now launching its brand exclusively to over 4500 GNC retail stores across the country. To learn more and get yours, please visit: http://www.resvitale.com/.